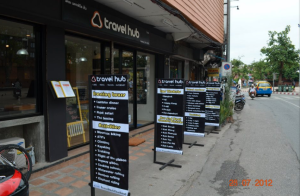 At Travel Hub we very much welcome walk in customers (if you do not want to book online or would prefer to chat with one of a staff about the tours and services we offer . We now have a very well located (and easy to find) Chiang Mai office at Thapae Gate! We are situated only 20 meters from Starbucks Coffee on Chaiyphum Road. If you make it to Thapae Gate you should see us quite easily!